I'm moving into my new uni house this week with a few of my girlfriends from my uni so I’m going to be on a bit of a blogging hiatus until my internet is sorted and I’m all settled in, but I thought I would share with you a things that are on my wish list for my bedroom. The things I have chosen are very girly because i want my room to feel cosy, feminine and homely when I get back from a long day at uni or work. Since having a look round on various websites I’ve found that looking on children's section of websites is also worth the look as they often have some really cute and girly pieces. supermarkets are also great for finding things to make your room a little bit more exciting without breaking the bank and you can do your weekly shop whilst you're there! All of these items come to the amazing total price of £60.70! 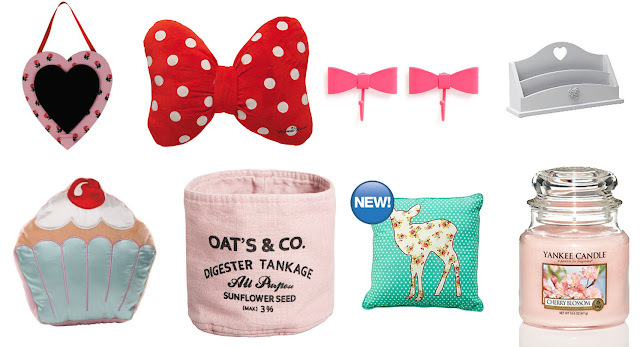 I think my top three purchases out of the wish list have got to be the adorable Minnie Mouse bow pillow and the deer cushion which is the amazing price of £5 from Asda, (such a bargain looks like it could easily be from Urban Outfitters!) Although not in my top three but definitely worth the extra mention is the letter holder also from Asda. It would make a great way to organise your desk if you have lots of essays and documents from uni if you are a student like me. Then the pink basket from H&M, which you could use as a handy piece of storage in your bedroom as great place to store hair straighteners etc. or in your kitchen. I love the dusty pink against the contrast of the black writing, I think it gives it quite a vintage Parisian feel to it. The basket also comes in three other colours, I quite like the look of the green! I'd love to know what your favourite piece is out the things I've chosen or if you know of any good online places to find bedroom bits! Thankyou! The Minnie Mouse Cushion is so fabulous I don't know anyone who wouldn't want it! I don't know why I haven't brought it already. Thankyou, glad you enjoyed my post & blog!